DIRECTIONS - do the game and answer the questions! Click on the picture below to access the tutorial and the game. On the tutorial page of http://www.sheppardsoftware.com/health/anatomy/cell/cell_game.htm for the animal cell, what statement is true regarding the order of the organelle names listed on the right side? The endoplasmic reticulum is listed first. The cytoplasm is listed last. The plasma membrane is listed first. Describe what happens to the background once you have completed the tutorial. The color changes and things swim by. Cells jump up saying YOU DID IT! the background spells out CONGRATS! The background asks if you are ready to take the quiz now. 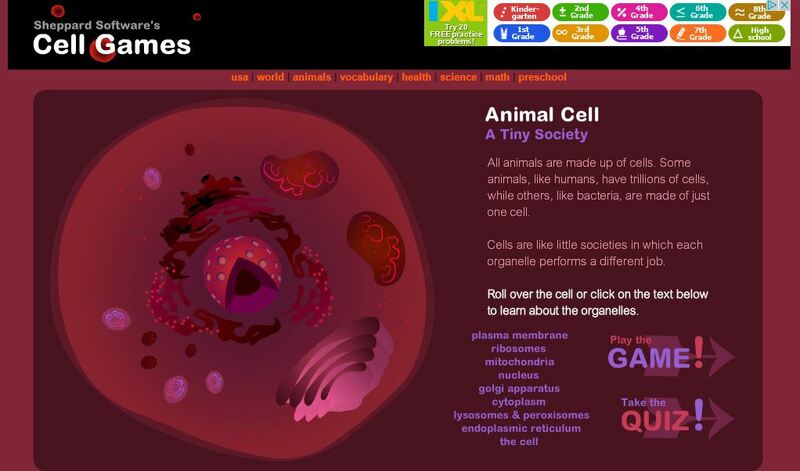 Go to the animal cell quiz located at http://www.sheppardsoftware.com/health/anatomy/cell/cell_quiz.htm. Chose the answer below that describes the text on this page. It says if you answer all the questions correctly, you will see a cell divide! It says if you answer all the questions correctly, you will see a cell cell-ebrate! It says if you answer all the questions correctly, you will see a cell dance! It says if you answer all the questions correctly, you will see a cell party! This key organelle holds the cell's genetic material, and dictates which proteins the cell produces. Like a packaging plant, this organelle puts lipids and proteins in packets (vesicles), and sends them to different parts of the cell. These little organelles follow instructions from the nucleus and create proteins that the cell needs. This thin lining controls what molecules enter and leave the cell. This fluid maintains the internal pressure of the cell, and holds many important nutrients. These organelles break down the cell's waste products and detoxify poisons. This organelle contains DNA tightly packed into chromosomes. This network of folds is dotted with ribosomes, which make proteins. It ships these proteins to the cell membrane or to other organelles. This organelle often ships proteins to the Golgi Apparatus. What color does the Endoplasmic Reticulum change to when you place your cursor over it? These organelles produce a molecule called ATP, which serves as fuel for the cell.